Jeremy Cannon of Cannon Ag Products is one of many farmers who is still recovering from the flood of October 2015 and Hurricane Matthew in 2016. Then the rain came. From the Midlands to the Lowcountry, record-breaking rainfall accounted for the deaths of 19 South Carolinians during the weekend of Oct. 3 and 4. The flood also devastated many S.C. farms with crops on the precipice of harvest. More than two years later, farmers are still recovering. Jeremy Cannon, a farmer in Turbeville, a small, agricultural town in Sumter County, was just a week from harvesting his cotton and soybeans when the flood overwhelmed his crops. I first spoke with Jeremy during the summer of 2015. Back then, he and his family were praying with all their might for a redemptive harvest in the fall of 2016. Instead, they got Hurricane Matthew, which again brought devastation to their crops. In 2015, the flood laid to waste $800,000 worth of crops in their fields. After the hurricane in 2016, they lost nearly $400,000. At the Cannons' farm in Turbeville, S.C. When I spoke with Jeremy again as 2017 came to a close, many of his hopes and concerns were the same as they had been one year before. While 2017 hadn’t brought the kind of disaster of the preceding years, it also hadn’t brought the redemption Jeremy was hoping for. Despite fine crops from the fall season, tepid markets made for an average year for his family’s business, Cannon Ag Products. Still, Commissioner for the South Carolina Department of Agriculture Hugh Weathers considers 2017, by and large, to have been a winning year for agriculture in the state. The yields from fall crops were, after all, robust. In fact, there was only one truly poor crop last year: peaches, which suffered from a late freeze in the spring. Otherwise, crops performed well. Weathers acknowledged, however, that the yield is only one factor in farmers’ success in a given year. Strong markets are also essential, and 2017’s markets were markedly soft. Weathers acknowledged, however, that for some farmers this won’t be progression enough. “There will be farmers that it may only be because of the yields they’re getting in 2017 that keeps them in business, but there may those in spite of the yields of 2017 that still might exit the industry,” he said. However, to Weathers, who was charged with helming agriculture during two of the most devastating years in the state’s history, a year without a vengeful storm (setting aside Hurricane Irma, which affected farms in the Pee Dee, but did little damage to the most valuable commodity crops) has to feel like a victory. A farmer himself, Weather’s joy at seeing the thriving crops of last fall was unbridled. SCDA Commissioner Hugh Weathers reflects on the joy of seeing 2017's flourishing crops, and his pride in working with farmers who persevere. “I intentionally drove as many backroads of South Carolina this fall as possible just to look at the beautiful crops. [There are] not many things to me prettier than a beautiful field of cotton, because it just gets so bright white if it’s a great yield coming on,” he said. Weathers remembers well the crushing feeling of looking at his own ruined crops in 2015, and the reactions of other farmers even more. On top of continued recovery from those losses, the Cannons were dealt another blow near the end of 2017. The day after Thanksgiving, Jeremy found out that his home was infested with black mold, most likely due to water that flooded its crawlspace during the 2015 flood. An inspector recommended that the Cannons evacuate the house. Jeremy also consulted a contractor, who told him that repairs could cost around $90,000, and that it might be preferable to “just start over.” This was difficult for Jeremy to hear, especially since he had built the house himself several years earlier. “I asked him, I said, you know, ‘How do you start over? And what do you start over with?’ We had a flood and hurricane that really took everything we’d saved, our whole—everything we’d ever worked for in our whole lives, our parents’ lives, and it got washed away in two seasons." It’s a good question. FEMA no longer has resources to offer the Cannons, and the family had no flood insurance for their home when the rain came in 2015. According to Jeremy, this isn’t uncommon in the area where his family lives, which is not in a floodplain. After the mold revelation, Jeremy, his wife Lacie, and their son moved in with Jeremy’s parents at their house located directly on the farm, bringing multiple generations of farmers back under the same roof. Jeremy represents the fourth generation to work at Cannon Ag Products. It is very much a family enterprise; Jeremy's father still works alongside him, and their business’ slogan is Faith. Family. Farm. To the Cannons, these pillars are essential and inseparable. The possibility of losing the farm threatens more than just income; it also threatens Jeremy's vocation and way of life, the only one that he knows. Jeremy and Lacie Cannon in 2015. “It’s something where, when you’ve never thought of doing anything else in your life, how do you find something else that you’d want to do?” he said. However, Jeremy also has doubts about whether his farm will continue for a fifth generation. It’s painful for him to imagine his eight-year-old son dealing with the same challenges that he and his father have faced. Jeremy Cannon ponders what it would be like to give up farming, and how painful it would be to see his 77-year-old father give up his life's work. Commissioner Weathers worries about the decline in generational farms like Jeremy’s. He says it represents a national trend, one that’s not only driven by hardships like those South Carolina has had with the hurricanes of the past few years. “Our farm family numbers are getting less and less . . . and as that next generation takes a job in the city, takes a different career, we have to look at those first generation farmers to maintain our agricultural production in the state." But Weathers is also worried about those first generation farmers, many of whom hadn't yet had an opportunity to build a safety net prior to 2015. The SCDA recently launched a new initiative called The Roots Campaign, which aims to promote the work of successful first generation and early career farmers, as well as provide education and transparency about the processes by which food is produced. “Most of them are in their 20s and 30s, telling the public about what they’re doing and how they innovate. That’s very encouraging, to see the talent that’s out there, that will be the future of South Carolina farming,” said Weathers of the farmers Roots highlights. Many first generation farmers in the state are in fact doing quite well. Jason Ashley, a cattle farmer in Anderson County who has been in business for around 10 years, attributes his recent success to progressive and sustainable farming techniques; he specializes in “forage-fed” beef, which requires more patience and sweat than beef that is simply grass-fed, according to Ashley. Jason Ashley shows one the forages he provides for his cattle. Ashley provides the cows with turnips, peanuts, soybeans, alfalfa and other food in addition to grass, which he said results in more flavorful beef. He also waits to slaughter the cows until they are steadily gaining weight. If a potential customer wants to order his product before the cows are ready, Ashley tells them they’ll have to wait. That’s one reason that sustainably raised beef is so in demand. “We set our price, and then if you want to buy it, great. If you don’t, there’s ten more people down the street that will, because they want that product,” he said. Of course, Upstate farmers like Ashley didn’t experience the same natural devastation as farmers in the Midlands and Lowcountry. 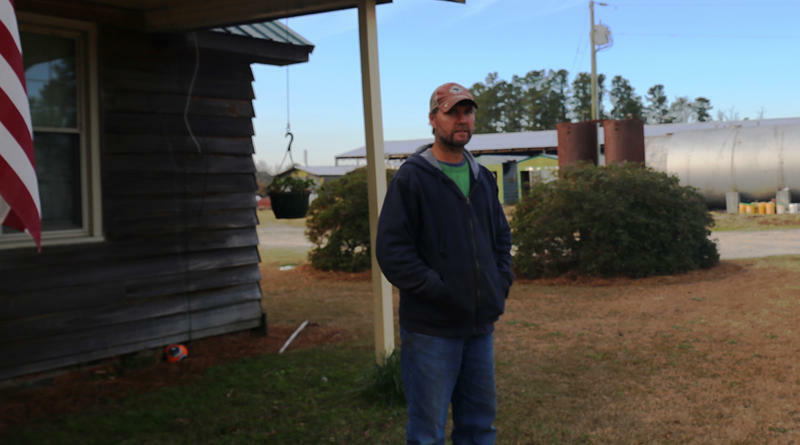 The success of Ashley's operation, Johnson Creek Farms, would likely have been somewhat tempered by weather conditions over the past two years if his farm had been located in the Midlands. His business model, however, suggests a farming future for the state that is markedly different from the multigenerational model of the past. Ashley said he doesn’t mind whether or not his two daughters decide to join him in the industry. That’s not to say Ashley’s kids aren’t interested, though. In fact, his oldest daughter, eleven-year-old Adyson, has already started her own farming business. Each day after school, she tends to a small flock of chickens, preparing them to eventually be sold to boutique restaurants and sustainable grocers in the surrounding counties, including several highly-rated Greenville spots like Bacon Brothers. She saves half of her profits to pay for college. Eleven-year-old farmer Adyson Ashley holds one of the birds in her flock. A soft-spoken girl with an air of matter-of-fact capability, Adyson politely shared with me the process by which she became a professional. The young entrepreneur enjoys farming and plans to be a lifelong farmer, but she isn’t sure farming will be her primary career. She said she might have another job, too. Her dad is okay with that. Ashley himself works another job in addition to farming—in radiology. “We’ll keep doing it just as long as it’s fun for her,” he said. For farmers who have inherited generations-old farms, their family’s future on the farm is a source of much greater distress. But that doesn’t mean they have given up. Jeremy Cannon’s business is just one of many farms that continue to struggle since the flood, and while support has been difficult to come by, many of them have chosen to stay in business and fight for renewed success. 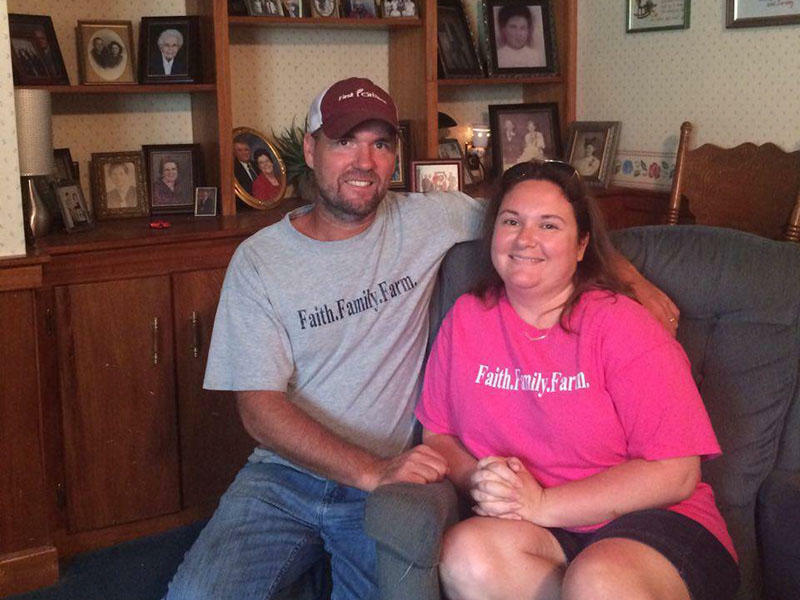 In the spring of 2016, Jeremy and other S.C. farmers fought for the passage of the Farm Aid Bill, which aimed to allocate state-funded financial support for the $376 million of damages caused by the flood. The bill, which promised $40 million to struggling farmers, was vetoed by then-Governor Nikki Haley, who compared the bill to an industry bailout. But the S.C. General Assembly overrode her veto, with several state representatives passionately defending struggling agriculturists. The relief the Farm Aid Bill offered was not comprehensive (grants covered up to 20 percent of the value of a lost crop for eligible farmers), but it represented a victory for farmers like Jeremy. Despite the long cycle of disappointments for Jeremy and his colleagues in agriculture, his hope is relentless. He’s gotten his hopes up before, and he plans to pick them up again. He said that the worry that "this year will be the last" has been on his and other farmers' minds more than ever lately, but that the feeling always subsides at the start of a new year, with the fresh preparation of the fields. "I guess it’s the same farmer mentality: you always feel like you’re gonna make it; one way or the other we’re gonna make it. Even though times have been tough for us recently, that mentality, that history of farming has prepared me for what we face, even with the house. I just feel like with God’s help we’re gonna make it." Those who work in agriculture can only do so much to mitigate the effects of drought, or freeze or flood. On some level, it's out of their hands. Belief that better harvests are on the horizon is part of the job. "It keeps you humble," said Jeremy, "but I like it that way."